Today, Feathered Quill reviewer Ellen Feld is talking with Deborah Stevenson, the author of The Last Rhino. FQ: You’ve written several children’s books, all fun, but each with a good message. What made you want to take on the plight of rhinos? STEVENSON: I have always been an animal lover. As a child, TV shows and movies, about African wildlife were very prevalent, and to me, there was nothing more fascinating. I have had a long-standing love affair with elephants, as you might have guessed from my previous book, Oy, Elephants! When I was researching charities that help elephants for that book, I noticed that many of them also work with rhinos. I became painfully aware of how dire the situation was for the world's rhinos. The more I read about rhinos, the more enamored I became with them and the more appalled I became at how precarious their future is. Sadly there is no shortage of real-life stories of baby rhinos orphaned due to poaching. They are heartbreaking, and I knew I wanted to do something to try to help. It is such a difficult subject, but I tried hard to address it gently but honestly, in way that would be meaningful for young readers. The biggest difference between Ayubu's story and the real-life orphans, is that Ayubu survives. Baby rhinos are highly dependent on their mothers for the first several years, and many real-life orphans do not survive the loss of their mothers. The year we finished the manuscript for The Last Rhino, I read a story about an orphaned rhino named Solio. She was rescued by a marvelous group called David Sheldrick Wildlife Trust. Though she was a female, her story mirrored Ayubu's so closely, that by the time I finished reading, tears were streaming down my face. It was right before the holidays, and I suddenly knew the perfect gift for my illustrator and editor on the The Last Rhino project ... I symbolically adopted little Solio twice, once for each of them, as their Christmas gifts. In a few weeks, I'll be doing a school visit with the local third grade, and as part of our classroom program I will be sponsoring another baby rhino that they will select. I don't think there is any better way to make the situation "real" for children than to let them connect with an actual young rhino that needs their help. In addition to raising awareness about the plight of rhinos, I also hope the book can raise some funds for groups working to protect them, and so a portion of the proceeds goes to rhino conservation. FQ: How much research did you do before beginning to write your story? STEVENSON: The Last Rhino evolved over several years. It began as a picture book manuscript, but the story did not quite fit that format, and so it eventually grew into a chapter book. I did quite a bit of research throughout that long process to learn about rhinos, their lifestyle and habits, their habitats and about poaching and its impact on rhinos and other wildlife. My goal was to make the story as authentic as possible, but I also wanted to include an informational section in the end matter, where children could learn more about rhinos, about poaching and about how they can help. 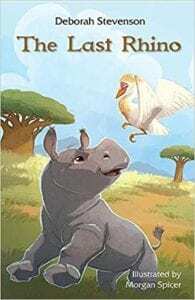 Because the story explores the relationship between the rhinos and Imari, their friend the cattle egret, I also wanted teach children a bit about symbiotic relationships in nature and about the special interaction of birds and mammals. Luckily there is a great deal of excellent information online through groups that protect wildlife, and many of those groups were very supportive and willing to answer my questions. FQ: I love the African names of the animals – Ayubu, Imari, Nthanda. Were you ever worried that children would have trouble with these names (great idea with the glossary at the back! ), or do you think that it helps draw them into the story? STEVENSON: I did think the names might be a little challenging for children, which is why I included the glossary at the back. But I also think the names are fun and draw them into the story and the feeling of Africa. The glossary helps with how to pronounce the names, but I also wanted to share the meanings of those names, because they were chosen very deliberately. Ayubu, which was partly chosen because my son informed me it is fun to say :), means one who continues to fight, despite obstacles. That epitomizes his character for me. Faced with tragic losses and extreme challenges, he never gives up and never loses his "humanity" ... the irony of assigning humanity to a rhino is not lost on me, but animals are very capable of compassion and they do feel loss and fear and determination. Nthanda, the name of the mother rhino in the story, means star, and I won't give away the story, but that is a pivotal association. The cattle egret, a most faithful friend to the rhinos, is named Imari, which means faithful friend. I love to incorporate details like these in my stories, that add another layer of meaning. In fact, the font we chose for the title on the cover and for the chapter headings has special meaning as well. It is called "Immortal," and expresses our wish for the future of the magnificent rhino. FQ: The lovely pattern you used to dress up blank pages – I assume it’s an African pattern? Where is it from and what gave you the idea to include it in the book? STEVENSON: Credit for incorporating that African pattern throughout the book goes to Jeanne Balsam, the book's designer. We were looking for a pattern to use on the back of the book that would tie in the colors and African feel. The tribal pattern was one of many we found on Shutterstock.com, and we fell in love with it. The artist is Liza Ievleva. It seemed perfect for the back cover, and as we started laying out the interior of the book, Jeanne had the clever idea to use the pattern for chapter breaks. It carries the look and feel through the entire book. She even found an interesting way to tie it in to the pages in the end matter. Those little details make such a big difference in the end product, and I'm thrilled that Feathered Quill noticed and appreciated that extra effort. I also appreciated that the judges' comments acknowledged the skillful editing of Krista Hill of L. Talbott Editorial, who always pushes my work to a higher level and adds so much depth and polish to each project we do together. FQ: The Last Rhino is a fun story with a serious message. What do you hope your young readers will come away with after reading the book? STEVENSON: I hope young readers fall in love with Ayubu, as I did...appreciate his struggles and identify with his perseverance. If they do, they come away with two important things: a connection with rhinos and the belief that they can make a difference in their future. If we are to rewrite the rhino's history, we need to believe it is possible to create change and we need to care enough to make the effort. It's easy to ignore a vague issue in a place far away, but when we come to "know" a rhino up close and personal, that literal and figurative distance is bridged and we start to grasp the magnitude of a tragic situation. There is so much in the world we can't control, but I always try to impress on children that they can make a positive difference in the areas that are important to them. I hope this generation of children will care about protecting wildlife, and I hope The Last Rhino encourages them to do so. FQ: Your illustrator, Morgan Spicer, is fantastic! Where did you find her? And please tell our readers a little about your collaborative process. STEVENSON: I adore Morgan Spicer! She is such a kind-hearted person, and her genuine passion for animals shines through in everything she does. She is an incredibly talented artist, but many people are that. I think what elevates her work to another level is that she is such a gifted storyteller. Her ability to find just the right way to visually tell a story is remarkable and she bestows such genuine emotion on her characters that you can't help but be drawn in and connect with them. I think that is her superpower. She also is adept at recognizing how children will relate to her art. I love to write, but my collaboration with Morgan is right up there with my favorite parts of creating stories for children. We share a love for animals, and we connect on many other levels. We also have differences, but they mesh well. Rather than leading to conflict, I think we each use the other's varying perspective as a springboard to take our work to a higher level. One of us will throw an idea out there, the other takes it a little further, and next thing you know, we're off and running in some new, fun, creative direction. I sometimes joke that Morgan is my external imagination and I always love seeing how she visualizes my words, often in pleasantly surprising ways. I bounce ideas off her early in my writing process as I develop a new story, and her input always adds an extra something special to the project. It's a treat to work with Morgan and I hope we have many more projects together in our future. As for where I found Morgan, it was quite by accident, though I suspect it might be a little closer to fate. A friend had Morgan do a portrait of her dog, and I loved it. So I contacted Morgan to see if she would do a portrait of my dog, Soren. She did, and it turned out to be some serious foreshadowing. A few years later, when I was beginning to work on my first children's book, Soaring Soren: When French Bulldogs Fly, about that very same dog, I happened to notice on Facebook that Morgan was illustrating a children's book. I asked her if she would consider illustrating my book. She read the manuscript and fell in love with Soren, and the rest, as they say, is history. I'm forever grateful our paths crossed and led us on this treasured journey together. FQ: I see that you worked with the International Rhino Foundation while researching the book. Would you tell us a little about them? Several other groups were very helpful and provided a great deal of information I used in my research: David Sheldrick Wildlife Trust, who I mentioned earlier, African Wildlife Foundation, Baby Rhino Rescue, Animal Avengers, Helping Rhinos, Lewa Wildlife Conservancy...these groups do amazing work. From programs that use canine teams to guard rhinos and sniff out contraband at airports, to rehabilitating orphaned rhinos, and even to community outreach programs in Africa to educate and provide economic alternatives to poaching, they work tirelessly to try to stop the poaching and habitat pressures that threaten wildlife. FQ: For the adults reading this interview, how can they get involved to help save rhinos? STEVENSON: They can support wildlife conservation groups that protect endangered rhinos and work to fight poaching and habitat loss. Donations, fundraising, educating—there is a level of involvement for every interest. They can support legislation to protect wildlife and vote for candidates who care about wildlife, and avoid purchasing contraband or other products imported from countries that abuse wildlife. For parents and educators, teach children about the gentle balance of nature and how the choices we make impact the wildlife that shares our planet. Read them books like The Last Rhino so they can connect with rhinos and other endangered species, and grow up caring enough to promote positive change. FQ: I know you’re always working on a project. Would you tell our readers what’s next for Deb Stevenson? STEVENSON: Haha...it's true I have no shortage of projects. Next up is something completely different...a rhyming picture book. I have not done this before, but I love trying new things and have been working with a terrific poetry coach to be sure I do it well. It's a lot more challenging than it seems, but I've had so much fun with it. 🙂 The story is fun and whimsical...a celebration of imagination and animals all rolled into one. I think Morgan is going to have a great time with the illustrations for this one and they are sure to be incredible. The Last Rhino was a very emotional story for me, and so perhaps this silly, fun manuscript has been just the lighthearted diversion I needed.